We have listed many free and paid PCB drawing software’sÂ and simulation tools before. 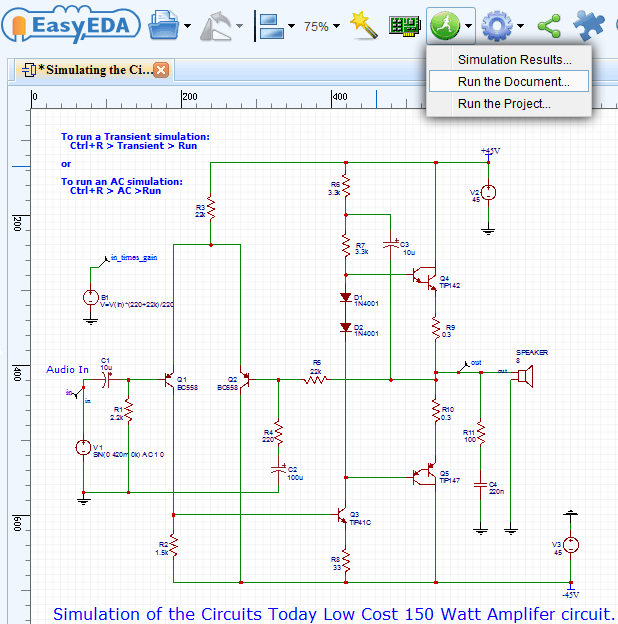 In this article, we are reviewing an online web based PCB schematic and simulation tool named EasyEDA. We have explained how to begin with the tool and in the process of explanation, we have shown how to draw the schematic of our popular circuit of 150 Watt Amplifier. So lets begin. 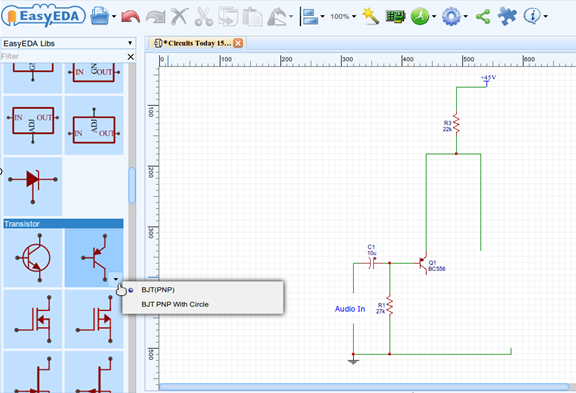 EasyEDA is a free web based EDA tool suite, integrating schematic capture, mixed-mode circuit simulationÂ and PCB layoutÂ in a seamless on Windows/Mac/Linux web browser(Chrome, IE9+, Safari, Firefox, and Opera).This article is intended to give an overview of how to use EasyEDA to create a schematic suitable for pushing through to PCB layout, with a quick look at how it can be used to simulate circuits and a glance at the start of the PCB layout process. Interesting? You can open http://easyeda.com/editor before reading further. Be patient, the first time to load the editor is a little bit long, but you just need one second to open it again. After opening the EasyEDA editor, Â you can find lots of components at the left hand of the canvas. 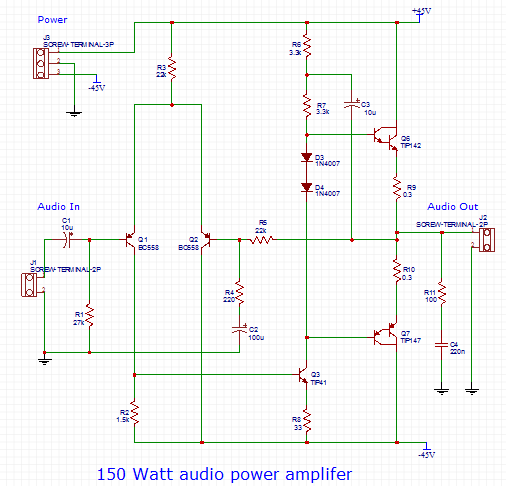 Â The schematic used to demonstrate these steps is the Low Cost 150 Watt Amplifier Circuit. Â Before drawing a schematic, you are suggested to note the following tips of EasyEDA. Space/R keys to rotate a part, X/Y keys to flip a part. EasyEDA has many hotkeys, all of which can be configurable. Hold down right button and pan. It is useful for reviewing a big schematic. Right Click Â to go to select a mode, EasyEDA does not have context menu now. Simply clicking on a part and then clicking on the Schematic canvas places a component. Some parts have a down arrow, which when clicked, shows variants of parts that can also be placed. Exit component placement by right clicking. Components can then be wired up simply by clicking on the end of device pins, dragging the green wire and clicking to add corners until clicking on the destination ends the wire. The wiring mode can be invoked using the WÂ key or from the floating Wiring ToolsÂ toolbar. Again, right clicking exits the wiring mode. Wires can be edited by selecting them and dragging the green handles around. Red dots clearly indicate that wires are joined and not just crossing. Extensive use is made of Â HotkeysÂ in EasyEDA. A full list of these useful shortcuts can be found and edited under the blue gear Config icon at the top of the window. The SpacebarÂ or the R key rotates and the XÂ and YÂ keys flip parts whilst the device model name can be edited directly by double clicking on it or by editing it in the right hand Properties panel. Clicking back on the canvas enters the change. Components and wires can be dragged using the mouse or by selecting them and using the arrow keys. The effects of these are slightly different in terms of whether wires are dragged with them or not. A left to right drag selects everything fully enclosed by the box whilst a right to left drag selects everything the box intersects. Now, This schematic is done. This schematic can beÂ edited online, Â and aÂ pdf versionÂ can be downloaded too. 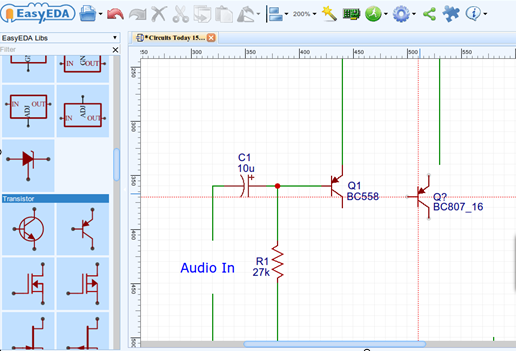 Â Note: Â simulating the Low Cost 150 Watt Amplifier CircuitÂ is a little bit harder for newbies. If you have known nothing about Spice simulation before, you can start form EasyEDA examples first. A copy of the schematic with additional parts, ready for simulation. This circuit can be edited online via this link http://easyeda.com/editor#id=h9FzR93kCÂ . Clicking on the Green ManÂ icon and selecting Run the Documentâ€¦Â or simply typing Ctrl+RÂ opens the simulation dialogue box and from there the type of simulation and the relevant simulation parameters can be set and then run by clicking on the Run key. Depending on the type of simulation that is run, the results and any error messages are shown in text form in the Simulation Results –> Show your simulation reportÂ window or in plot form in the powerful WaveForm viewer. A spice netlist of the simulation can be downloaded from the Show your simulation reportÂ window and plots in the WaveForm viewer can be analysed using the on-screen cursors. The display area, trace, grid and background colours and the placing and hiding of traces on up to 3 grids in WaveForm can all be easily tailored from the WaveForm Config button. WaveForm plots can also be saved into Project folders where they can be re-opened and manipulated the same as when they are first generated. Â Saved WaveForm plots can be exported in a .pdf, .png and .svg formats. 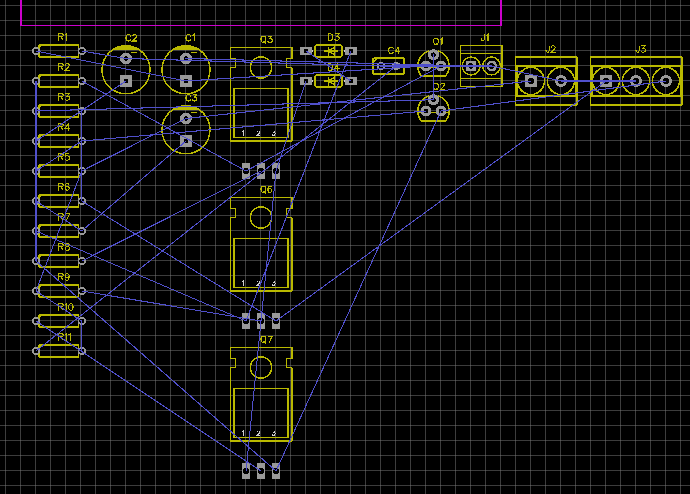 Pushing the schematic through to PCB design. Checking and correcting packages prior to PCB layout. Clicking Build PCBÂ then opens the PCB design canvas with a default board area and all the components set to one side, connected by ratlines ready. Next, a couple of hours need to cost for making this audio project done. EasyEDA is a web-based service and although you are free to use it in anonymous mode which you can do without creating an account, you are much better off creating an account to manage your own designs and parts libraries. Creating an account is easy and gives you free access to the full power of EasyEDA for as long as you wish. After clicking on Join, a very simpleÂ Create an accountÂ dialog opens. 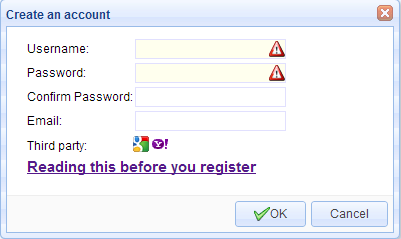 If you have a Google or Yahoo account, you can click the third partyÂ icons directly to create an account. It is difficult to do justice to such a flexible and comprehensive tool in just a few pages and screenshots. There are many powerful functions such as symbol and footprint creation and editing, basic hierarchy, adding models and subcircuits to spice symbols and schematics, collaborative designing that have been left out. 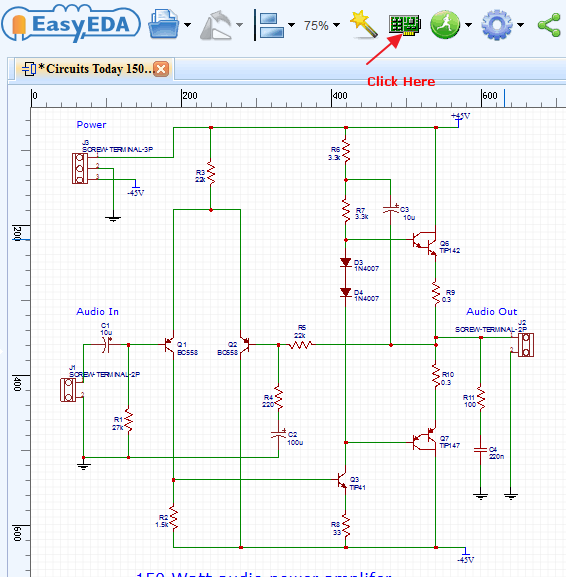 More in-depth information can be found in the EasyEDA TutorialÂ but it is hoped that this article has at least given the you a quick start guide in how to drive EasyEDA and a flavour of the many features it provides to make an Easier EDA Experience. Nice sharing, It is awesome. I think EasyEDA is the just software which I try to find . 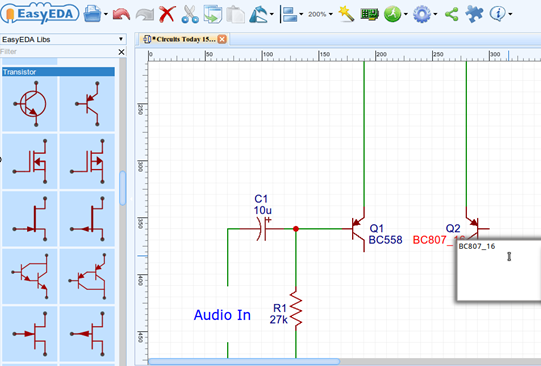 Draw schematic online, genius idea, great tool. this is best sofware i have ever seen,u can simulate ur circuits at any places it just required net connection. i thank to that person who made such a useful sofware. This is the best software that I used to draw a circuit. It didn’t take long to learn and design a board. I can’t wait to order some PCBs to test out. This simulation software is so much helpful for us.